Jakob had started his bike tour, as we know, at the beginning of November 2017 in Lisbon, destination Tallin. Some countries on the way there, towards north-east, he arrived in Turkey a few weeks ago. A serious accident has stopped him - not with the bike but as a passenger in a car. Jakob will not be able to continue his tour. One leg is seriously injured and he is now receiving medical treatment at a hospital in Munich. Understandably, his father Carsten has also interrupted his tour on foot to Tallinn. He wants to see how Jakob's health is developing. 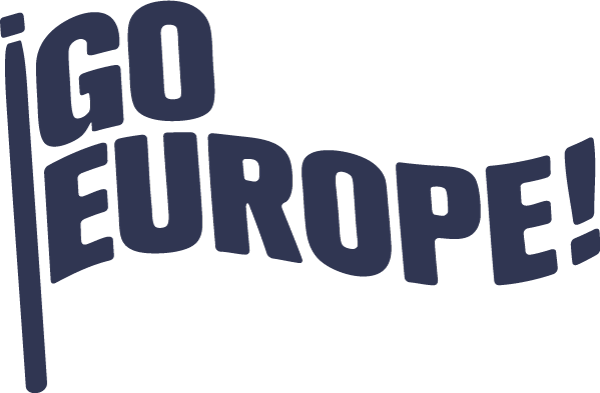 The initiative Go Europe !, especially Carsten and Jakob, would like to see interested people get on the road for our cause - whether by bike or on foot. We appreciate your message. his hiking trail from Lisbon to Tallinn in the city hall of Bordeaux. Olivier Ramanour, Director of International Relations, discussed ways and means by which civil society can contribute to the preservation, maintenance and enhancement of Europe: living security in peace, the diversity of regions, responsibility in a global context. Special thanks go to Marie-Elisabeth Sapain, Head of Unit, who facilitated and accompanied this meeting. What will we do with Europe? Human and civil rights, democracy, the rule of justice and cultural traditions – these are principals that make Europe sustainable! The much used catch phrases “United States of Europe” or the “ever ongoing European Union” are not a satisfying perspective. We should instead work together to develop a new order. This can be driven forward by European citizens, European regions, European parties and a European civil society. Europe is far too important to be left to politics. Europe is much more. 2nd stage: Since November the 27th we are dicovering country and people in Spain. Go Europe! is proud to have been invited to take part in the Carcoboso Agroecológico Fair, which promotes sustainable agriculture and rational land use planning. We believe sustainable land use can only be achieved if the preservation and biodiversity of the whole system are taken into account. Today's generation has the responsability to manage its resources in a way that our quality of life can be shared by all future generations. Please visit the website below for more information about the Municipality of Carcaboso. 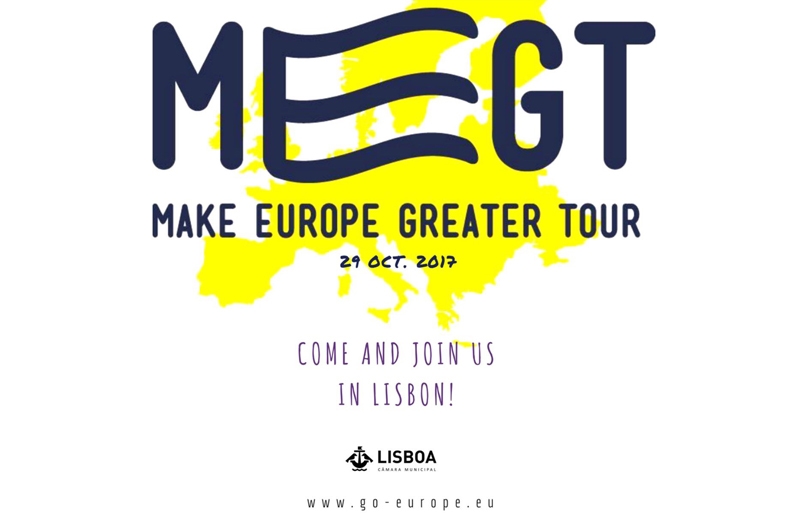 On November 2nd, the "Make Europe Greater Tour" started as planned from the Praco do Commercio in Lisbon. Initiator Carsten Witt set off on foot, his son Jakob and friend Max began their tour by bicycle. We are looking forward to the people who are going to join us on various legs of our yearlong Go Europe! tour. Interested? Please contact us! Full of optimism, we started from Munich on October 21st by electric car. Admitted: The journey to Lisbon is not managable on a single day by "normal" car either. Our two drivers, though, finally arrived on October 27th. A lot of frustration, bordering to desperation, was caused by disfunctional, incompatible or missing charging stations along the whole route. Our compensation: beautiful landscapes and - above all - many helpful people. Europe may not yet be ready for smooth electromobility, but it sure is beautiful and full of nice humean beings. 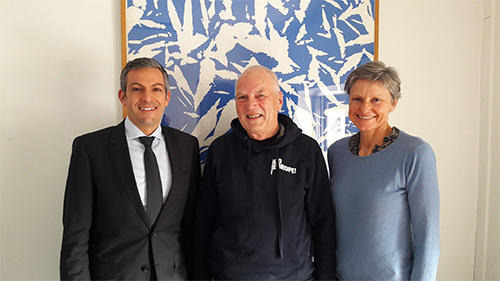 Enabling encounters at a place which was once inhabited by horror - to transform the former Patarei prison in the Estonian capital, Tallinn - is the vision of Carsten Witt, the founder of Go Europe!. The Patarei - built as a Russian sea fortress in 1840 - was used by many regimes as barracks, concentration and work camps, and a prison. The past few years saw the Patarei open for tourists and residents. It was explored for traces of inhumane history that is still evident everywhere. The Patarei has been used and seen by artists, not just Estonian, as a meeting point and a challenge. At the moment, the fortification is closed due to safety hazards. Many groups have various visions and proposals for the renovation and the future use of the Patarei. And that is exactly where Go Europe! stands: to create a European community centre in the four hectare sized building. Go Europe! is in contact with authorities in Tallinn, to transform the Patarei into a place of congress and openness, and therefore, a symbol of multicultural life in Europe. Carsten Witt completed an apprenticeship as a steel draftsman before he went on to study civil engineering in Aachen. After graduation, he went onto work part time in Bochum and Leipzig where he started a doctorate in sports psychology. He entered a new vocation at the Obermenzinger Gymnasium (Obermenzing High School) during the years 2009-2013. Alongside successful projects concerned with the environment, he travelled with school pupils and teachers to various European cities as part of the COMENIUS programme. Triggered by the question of possible uses for the Patarei complex during a trip to Tallinn in January 2016, he consolidated his diverse experiences into the founding of Go Europe!.